Backing Young Bury is our campaign to help improve learning and working opportunities for young people in the borough. The campaign also helps to ensure that Bury Council has a skilled future workforce. Backing Young Bury has already led to a significant increase in the number of young people accessing apprenticeships and work experience opportunities. We are committed to providing more opportunities for young people, including extended work experience placements, pre-employment training and an increased number of a varied range of apprenticeships. We regularly offer apprenticeship opportunities within Bury Council and have expanded our apprenticeship offer over recent years. All Bury Council apprenticeship vacancies are advertised within the Bury section of the greater.jobs website.. Towards the end of 2017 Bury Council recruited 26 new apprentices to help give young people a flying start to their working lives.They are employed in a wide range of services including legal, accounting, workforce, registrars, leisure centres, recruitment team, art gallery, occupational health, ICT and grounds maintenance. This was the first large cohort of apprentices taken on by the council since the introduction of the Apprenticeship Levy, and it supports the council's aim to comply with the Public Sector Recruitment Target. Councillor Rishi Shori, leader of Bury Council, said: "I am delighted to welcome so many new apprentices to the council. It is absolutely vital that we give our young people a chance to fulfil their potential, learn new skills and be ready for the world of work, and we are proud to play our part in ensuring they get a foot on the employment ladder. I wish them the very best in their time with us and onwards in their careers." Since then we have continued to recruit apprentices across the organisation and in September 2018 recruited another large cohort of 22 apprentices. "I grew up in Oldham until I was 14, when my mum decided to move to the Isle of Lewis in Scotland where I studied accountancy for the first time. I spent nearly 4 months up there before moving back down to live in Oldham again where I wanted to continue my studies in accountancy but was unable to until I went to college and studied towards my Level 2 and 3 AAT qualifications, which I obtained. 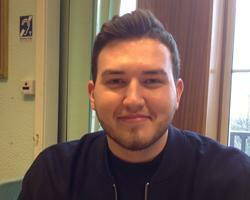 "I moved to Bury after finishing college with the hope of finding a job in accounts. But I struggled to find a job, and I spent a number of years bouncing from job to job in retail and call centres before a family member pointed out they were doing apprenticeships at the council and one of them was an accounts job. After hearing about this I went through the application process and was surprised to be notified on the same day of my interview that I had been successful. Completing the apprenticeship is a way for me to obtain much-needed experience working in accounts while completing a qualification provided by a professional body. James lives in Bury and went to St Gabriel's High School and Bury College, where he completed a public services B-Tec course with D*D*D*. "I heard about the Bury Council apprenticeship scheme through the 'indeed' jobs site," he said. "I was motivated to apply because I had worked for a mobile phone company in Bury for 4 years and I felt I wasn't pushing myself anymore and there weren't many chances to progress. 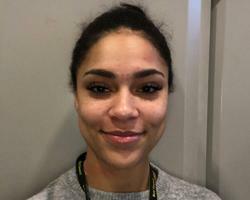 "This is offering me a new challenge, a qualification, good working hours and hopefully at the end of it the skills they require to keep me on - but, if not, I will have a qualification and a wealth of knowledge to take to a new employer. "I wasn't sure entirely what the job would entail but after speaking to my cousin who completed the same course my mind was made up. Over my apprenticeship I hope to improve my people skills and gain a good understanding of the role as well as of the council as a whole. 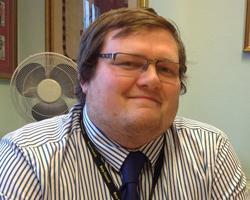 So far I have enjoyed the admin role as I am getting involved with everything." 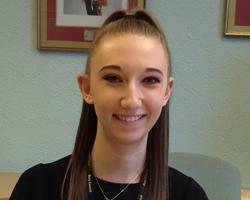 Lois studied at St Monica's RC High School in Prestwich and then Bury College, and heard about the apprenticeship scheme on the 'greater jobs' website. "I was motivated to apply because at Bury College I studied B-Tec Level 2 business and within that finance and marketing, and ultimately gained an overall grade of DM (Distinction/Merit). I then had to decide whether to do an apprenticeship or carry on through college and go for the B-Tec Level 3 business course. "However, after finding this great opportunity, I decided to choose the Bury Council apprenticeship. During my time I want to learn new skills and improve my knowledge and understanding of the business environment. I've yet to decide what my long-term job will be, but this will definitely be good for my career." From Bowker Vale, Shawna went to Phillips High School in Whitefield, followed by Bury College. "I found Bury Council's apprenticeship vacancies on the apprenticeships.gov website and decided to apply. I was unsure what I wanted to do as a career in this transitional period of my life, so I thought by getting an apprenticeship in an area I'm interested in I would be able to acquire some transitional skills which would aid me in any career I should choose. I have already learned a lot but I would specifically like to learn more about the role of social workers and family support workers. 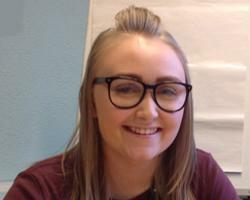 Ultimately, I would like to be a family support worker or social worker and am considering going to university after I have achieved my apprentice qualification." From Radcliffe, Shannon attended St Monica's High School and completed her A-Levels at Holy Cross College. "I heard about Bury Council's apprenticeship scheme from my auntie, who started out as an apprentice in HR at the council. She told me how the scheme is part of the 'Backing Young Bury' campaign and how well it works for young apprentices." Shawna had worked in a restaurant, but decided it was time for a new challenge. "Throughout my apprenticeship I would like to get involved in as much as I can, throughout my department and the council as a whole. As I am doing a Business Administration course I wish to learn as many skills as I can in this field, and to complete both my Level 2 and Level 2 NVQs. "I am really enjoying how varied my role is and I would like a career that gives me a wide variety of duties. Within Bury Council there is a multitude of opportunities and I look forward to coming into work each morning as there are always new tasks and projects I can get involved in. For anyone who is thinking about working for Bury Council or doing an apprenticeship here I would recommend you go for it as it's a great place to work!" Work experience is paramount in providing young people with the opportunity to experience the working world, which can initiate growth of their future aspirations, knowledge and skills. Our work experience scheme champions opportunities for young people and helps to establish work experience placements within the council. This ensure that the young person and Bury Council get the most out of the placement. We offer work experience placement for various time periods to students aged 14 to 24. If you would be interested in undertaking work experience at Bury Council then contact your work experience co-ordinator in your school or college, or alternatively you can contact us direct. The government has set a target for public sector organisations to have 2.3% of their workforce made up of apprentices. Our progress towards this target can be found here: Apprenticeship data - Public sector recruitment target [42kb].